If you’d like to raise funds for one of our projects or help to organise an event, please email gavin@music4children.org or visit our JustGiving page. 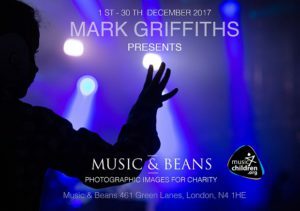 Music photography exhibition by Mark Griffiths. Prints are being sold to raise funds for the girls staying in Our Home in Nepal. Follow the link for more info (and click on the image for a preview of the exhibited prints). There are also event details on Facebook. More info about Music & Beans available here. You can also support the girls in Our Home by making an online donation.